Sadhya’s lunch box. Since returning from Kyoto in April, She has been practicing everyday to bring to work a complete home-cooked meal for lunch. 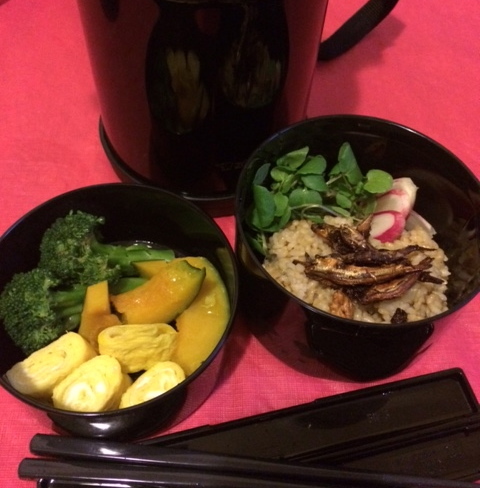 Her lunch box, which she brought from Japan, keeps the meal warm. The Satsangha in this month’s issue of Pranavadipa, Vol. 31, is a continuation of the Satsangha previously published in Pranavadipa Vol. 30. During this Satsangha, which was held for newer students who had just begun to practice, Shri Mahayogi explains the basic teachings in simple and easy to understand language. The wise practitioner knows that we are all beginners and, OF COURSE, the depth of this teaching may only be revealed the more we actually put it into practice. This particular Satsangha will also continue into next month’s issue of Pranavadipa. Currently Shri Mahayogi is here in New York, and the first class with Shri Mahayogi will be held tomorrow. Let us all deepen our practice, so that we, as practitioners, can ask Shri Mahayogi questions that arise from the experience of actually putting the teaching into practice! The question is: How do we deepen our practice? The Testimonies in Pranavadipa Vol. 30 and Vol. 31 both relate to actual practice and the teaching of samarasa. It is inspiring to know how practitioners practice samarasa, as well as the discoveries they have made through their practice.